AS YOU read this, I should just be returning from Bangkok from another conference of writers and translators, and I’ll be reporting on that encounter next week. But before anything else—and given this context of world literature in which I’ve been immersed for the past two weeks—let me voice my concern over a development I’d heard about in my absence pertaining to some contemplated changes in our high school curriculum. With our educational system shifting to the K-12 scheme—which I’m in favor of, just to be clear about that—our teachers and school administrators have had to review the curriculum to adjust it to the opportunities presented by the extra class time. The plan being prepared by the Department of Education and the Commission on Higher Education was for high school seniors to have two semesters of literature—regional and world literature, meaning, literature by Filipinos outside of Manila and literature written by everybody else. Those of us who teach literature in college were elated to hear about this, because we see how valuable literature is to exposing young Filipino minds to the dynamic realities and challenges of the world around them—beginning with us as still a nation-in-progress, which regional literature helps to build, and with our growing engagement with Southeast Asia and the rest of the planet, which world literature makes sense of and amplifies. Comes now the news that the DepEd has decided to compress these two semesters into one and to treat both regional and world literature as one subject, which doesn’t make sense for the teachers of these subjects and disperses the intended focus of our concerns in these areas. Makes me wonder what we added those extra semesters for, and, worse, if literature is going to continue to be treated as a disposable frill without any real bearing on national development. Have any of our government officials figured out by now that part of the reason we have a “Zamboanga hostage crisis” or a “Mindanao problem” is that we’ve never really introduced and explained ourselves to ourselves—which is what art and literature do for a people? Let’s hope that the DepEd rethinks its position on this matter, before it’s too late and before we fall farther behind our Asean neighbors in using culture as a foundation for nationbuilding. As I reported last week, the experience of having parts of my second novel Soledad’s Sister translated into Bahasa Indonesia (where it reads as “Saudara Perambuan Soledad”) reminded me of other fruitful encounters I’d had with my previous translators: Clara Nubile, who translated Soledad into Italian for Isbn Edizioni, Marta Alcaraz, who translated Killing Time in a Warm Place into Spanish for Libros del Asteroide, and Jean-Pierre Aoustin, who translated Soledad into French for Mercure de France. I’d had lively discussions with all of them, especially Jean-Pierre who turned out to be an old Manila hand and who met with me on a recent vacation here. I think it was Salman Rushdie who once said that “the most interesting parts of a language are the untranslatable ones.” Be that as it may, translators have to do their best to come closest to an author’s original intentions, knowing that it is an impossible and fruitless task to strive for 100% fidelity and accuracy, but creating a space for negotiation and understanding between cultures in the middle of the two languages, the source and the target. Clara, I recall, asked me to describe what kind of a criminal operation a bukas-kotse gang was. Marta had a load of questions about juego de prenda, the tuta in “Marcos Hitler diktador tuta!”, and why I had chosen to call the ruling party under martial law the “PNR, or the Party of the Newly Risen”; I explained to her that the actual martial-law government party was called the Kilusang Bagong Lipunan, or Movement for a New Society. I used PNR as something of a private joke, as the initials also stand for Philippine National Railways (a reference to how everything was railroaded under martial law) and for the Filipino phrase “puwede na rin,” or “it will do” (a reference to mediocrity). Jean-Pierre wondered about my use of “laundry on the clothesline” and if it had any cultural resonances; I told him that we Pinoys still hang our clothes out to dry, and that you can half-expect to find your favorite jeans and shirts gone from where you left them if you don’t watch out. In other words—literally, I guess—translation involves much more than figuring out equivalents for individual words and phrases; the translator keeps looking for similar, familiar experiences in the target culture to convey a working sense of the author’s meaning. In Jakarta, my group and I—with the Bali-based translator and art critic Arif Prasetyo facilitating—went over words and phrases that the Indonesians had flagged. Why did I use “cloud-curtained” to describe a rainy evening instead of just “rainy”? (Because it was the novel’s opening scene and I wanted a touch of the theatrical.) Why did I say “a million gas stoves roared to life”? (Because I wanted both the sound and the image of the gas fires coming awake, mirroring the headlights of motorists and even the flowers in the plane’s cargo hold.) When I wrote that the sudden downpour “blurred glasses and windows,” did I mean “eyeglasses”? (Yes, to set up a motif having to do with seeing and perception.) We had fun with the word duhat, which I’d kept in the Filipino original, not knowing its English equivalent; some Googling with images established that, in Bahasa, it was the local jamblang, also known as the duwet or the black plum (but if I’d used “black plum” in my novel, not a single Pinoy would have known what I meant). Just as interestingly, my translators found a couple of mistakes in my novel, which I acknowledged with equal amounts of embarrassment and gratitude. One was a small typo, the other a major boo-boo: I’d said that the flight from Jeddah to Bangkok had “stretched the daylight with it,” but an alert member of the team who had actually been to Jeddah (I never had) noted that it worked the other way around, that one flew more quickly into the darkness. I promised to correct this in the next edition. And so my adventure with the translators went, full of surprises and revelations. I learned much from listening to Kate Griffin talk about how, in the UK, interest in translation has been drummed up through popular word games, and how the BCLT (which is based at the University of East Anglia in Norwich, where I began Soledad’s Sister as a David TK Wong Fellow in 1999) combines teaching, research and expertise with an ambitious outreach program. Eric Abrahamsen, an American who has been based in Beijing for the past 12 years, spoke about how he helped form Paper Republic to band translators of Chinese together to professionalize their trade. 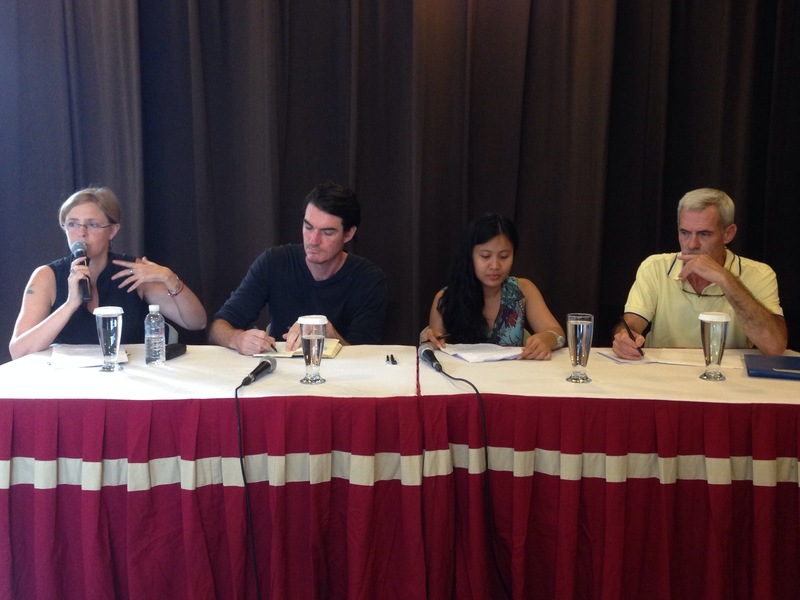 John McGlynn, an American translator who works with the Lontar Foundation which translates and publishes Indonesian writing into English, brought up the painfully obvious point: translators don’t get paid enough for their work. Ideally, he suggested, translators should get at least $20 (or, to us, P1,000) per page, given that the US State Department paid professional translators like him $30 per page for contracted work. In reality, however, Indonesian translators got a tiny fraction of that suggested amount. “Factor in the cost of printing and distribution, plus royalties for the author, and you really have very little left for the translator,” said John. Indeed, translators around the world have a long way to go to attain the same respect and consideration given to the authors whom they lend their voices to, but like the writers themselves, they have no choice but to persevere, the unacceptable alternative being silence and ignorance. This entry was posted in Art & Culture, Education, Travel, Writing and tagged 2013, Jakarta, translation, travel by penmanila. Bookmark the permalink.